Have you all seen the recently-revamped Lonny? They just launched a new format and included in the new issue is a chic San Francisco home designed by Susan Greenleaf. The home is sophisticated, yet playful thanks to the hip young family who lives there. That sense of style and whimsy are on display in the home's dining room features beautiful millwork paired with the easy elegance of a woven seagrass rug. 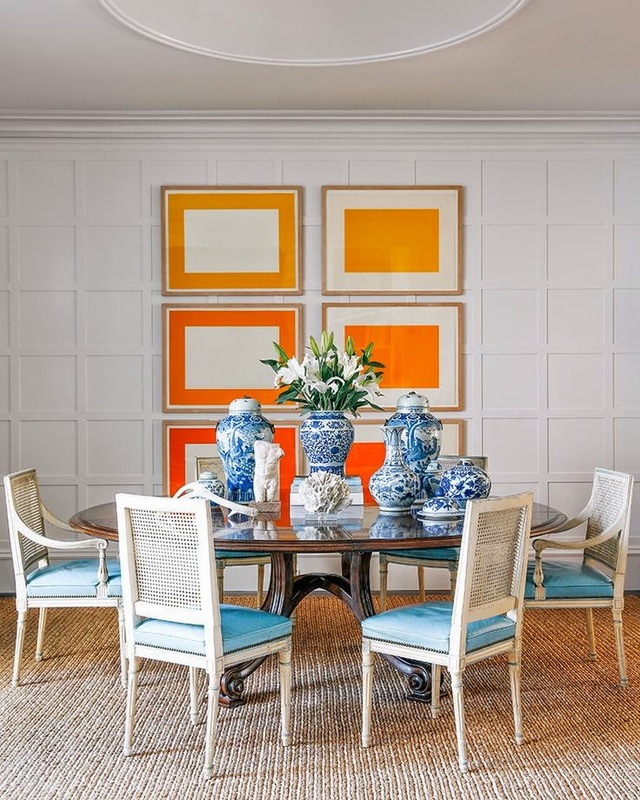 The cane-back Louis XVI chairs feel vibrant and unexpected with their turquoise leather upholstery and the juxtaposition of the antique dining table and classic blue and white delft porcelain against the series of punchy, geometric art is so fun. Being the lighting aficionado that I am, the only thing missing for me is a chic chandelier, but I'd say this room is all-around pretty fabulous. I am still in L.A. today for another fun and inspiring day at Legends of La Cienega! Be sure to follow along on Instagram for exclusive behind-the-scenes glimpses into this fantastic event. Paloma I adore this fresh dining room for s young family. Also love seeing you having a great time At Legends of La Cienega! Beautiful. It looks so fresh and modern.